The following illustrations show how togain access to the bulbs. When replacinga bulb, make sure the hybrid system andlight switch are off. Use bulbs with thewattage ratings given in the table. The stop lights and high mounted stoplightconsist of a number of LEDs. If any ofthe LEDs burn out, take your vehicle toyour Toyota dealer to have the light replaced. 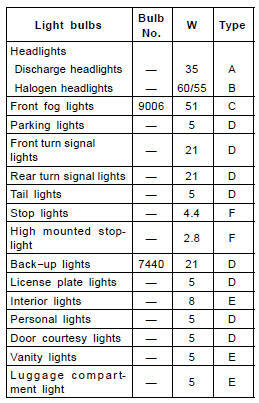 If two or more LEDs in a stop light burnout, your vehicle may not conform to locallaws (SAE). To prevent burning yourself, do notreplace the light bulbs while theyare hot. Halogen bulbs have pressurized gasinside and require special handling.They can burst or shatter ifscratched or dropped. Hold a bulbonly by its plastic or metal case.Do not touch the glass part of abulb with bare hands. Do not touch the high−intensity dischargeheadlight’s high voltagesocket when the headlights areturned on. An extremely high voltageof 20,000V will be dischargedand could result in serious injuryor death by electric shock. Do not attempt to take apart or repairthe headlight bulbs, connectors,power supply circuits, or relatedcomponents. Doing so couldresult in electric shock and seriousinjury or death. Call your Toyotadealer for headlight repair or servicing,including replacement of bulbsand bulb disposal. The inside of the lens of exterior lightssuch as headlights may temporarily fog upwhen the lense becomes wet in the rainor in a car wash. This is not a problembecause the fogging is caused by thetemperature difference between the outsideand inside of the lense, just like thewindshield fogs up in the rain. However, ifthere is a large drop of water on theinside of the lense, or if there is waterpooled inside the light, contact yourToyota dealer. 1. Open the hood. Remove the clipsand take out the cover. Remove and install the clips as shown inthe following illustrations. 2. RIGHT−HAND HEADLIGHT ONLY: Removethe clip and take out the aircleaner inlet. Remove and install the clip as shown inthe following illustrations. 3. Unplug the connector. Turn the bulbcover counter−clockwise and removeit. 4. Release the bulb retaining springand remove the bulb along with thesocket. Install a new bulb into thesocket and return the bulb retainingspring to its original position. To install a bulb, align the tabs of thebulb with the cutout of the mounting hole. 5. Install the bulb cover and turn itclockwise. Plug in the connector. If either the left or right front fog lightsburns out, contact your Toyota dealer. Do not try to replace the front foglight bulbs by yourself. You may damagethe vehicle.